Lock Haven University men’s soccer coach Patrick Long instructs an athlete during a game. Long is a former graduate of Central Mountain High School. The Country music duo Montgomery Gentry sings a song that I love called My Town. This is a song I think of when I consider the two subjects of this profile. Lock Haven is and has almost always been home to two coaches on the Lock Haven University athletic coaching staff. Truly, they could make the case to recruits that “this is my town.” In other words, it’s a good place to be. 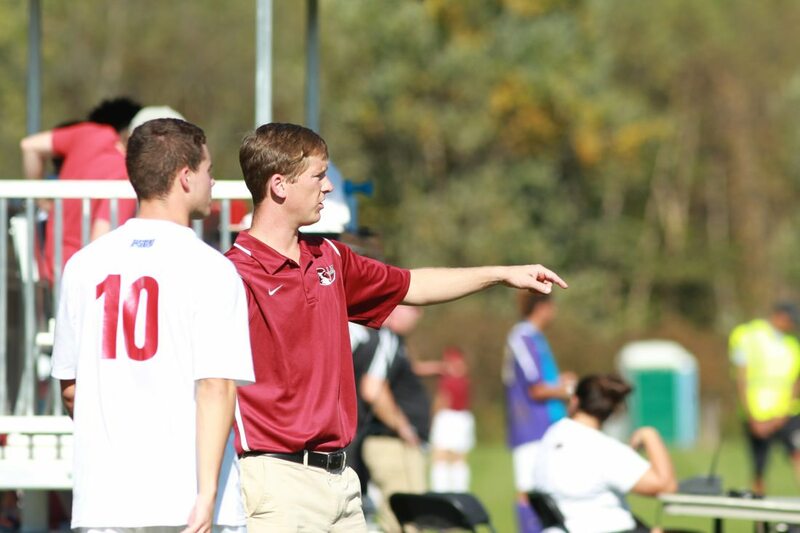 Patrick Long is in his second year as Head Men’s Soccer coach at LHU. Patrick is the son of former Bald Eagle head coach Lenny and Maribeth Long. Patrick was born and raised in Lock Haven. Also, now on staff at The Haven is Ty Traister. Ty, the son of Mark and Cathy Traister, is one of the newest members of the Bald Eagle football staff. Even though he was born in Williamsport, he has made Lock Haven his home since age five. Long and Traister graduated from Central Mountain High School and Lock Haven University where they were successful athletes in their respective sports. Long graduated from Central Mountain in 2003. While there, he was a three-sport athlete participating in soccer, basketball and tennis. After graduation, he chose to attend the local university where his father had coached during a very successful run from 1984-1996. It was a run that produced multiple PSAC championships, All-Americans and Academic All-Americans. After a four-year playing career and graduation in 2008, Patrick headed to East Stroudsburg University where he earned his Master’s Degree in Sports Management and began his coaching career as a grad assistant. That was a two-year stint. With his master’s degree in hand, he was fortunate to be hired as the top assistant coach at Division I Bucknell University by head Coach, Brendan Nash. Long credits much of what he does as a coach to Nash’s tutoring. He says that he often finds himself thinking, “What would Nash do” when he is faced with a situation or dilemma. He undoubtedly enjoyed his six seasons in Lewisburg but when the head coaching position arose at his alma mater, it was too good of an opportunity to pass up. He knows the tradition. He knows the standards and expectations. Some would shy away from such a situation. Patrick relishes that situation. He said the expectations and pressure is high but he loves that. So as he prepares for his second full season as the boss of the Bald Eagles, I discussed some coaching issues with him. First, I asked Patrick when he knew he wanted to be a coach. He said that was early in high school. As a high school soccer and basketball player, he found himself becoming intrigued by the way his coaches would handle situations, and how they would say things. He did say that while he would have been happy to use his bachelors degree in secondary education social studies to teach and coach at the high school level, he realized during his college days that his preference was to coach at the collegiate level. Why not? He’d obviously spent his childhood years watching his dad’s teams play and knew what the game was all about. That philosophy resonates loudly with Patrick as he says that he finds the most enjoyable part of coaching to be “recruiting and finding the right people.” Then “working with and watching them grow over the next few years” is exciting and rewarding. Traister who will coach the other version of football at The Haven was hired by Coach Dave Taynor to join the LHU staff back in June. Ty was a 2007 graduate of Central Mountain High School, where he played football and basketball with success. Upon graduation from high school, he accepted a scholarship to play football at Bloomsburg University. After redshirting in his freshmen season, he started six games at tight end for the 11-2 Huskies the following year. Upon completion of his second year at Bloom, he decided to return home to Lock Haven University to pursue a degree in Health and Physical Education. While a Bald Eagle, he spent the bulk of the next two seasons splitting time between starting at tight end and defensive end before suffering a career ending injury. He eventually earned his bachelor’s degree and then a master’s degree in Sports Administration in December of 2013. Traister began his coaching career by serving as a junior high coach in the Central Mountain football program while he was still in school at LHU. Then, while he was working on his master’s degree during the 2013 season, he served as a graduate assistant on the staff of then LHU head coach, John Allen. With a master degree in hand and some coaching experience under his belt, he accepted an offer to become the head varsity football coach at Northampton High School in Eastville, Va.
That was not exactly what many would consider to be a dream job for coaches at the time. In fact, the program that Traister took over was a mess. It was a program with no junior varsity team, 17 kids on the varsity roster and oh yeah, they were also riding a 32 game losing streak. By 2016, Traister and his staff were able to increase participation in the high school program to 60 kids and re-launch the JV program. At the same time, they showed a 2016 record of 4-6. Might not sound like much to some but remember where they started. This June, Ty made the decision to leave Virginia and join the LHU staff, where he was assigned the duty of coaching tight ends and will also play a part in the coordination of special teams. Off the field, he will have duties as well. He will serve in the capacity of academic coordinator and assist with alumni relations and special events. As for who influenced him as a coach, he credits his parents who he says were very successful athletes in their own right. He says of them, “they always helped me get the most out of myself and grow as a person and athlete.” Additionally, he credits many of his youth and high school coaches…some good and some not so good for teaching him many things about life and not just X’s and O’s. Ty says that the biggest challenges he sees in coaching today is working with young athletes who often have very short attention spans so you need to be informative and creative to reach them. He also finds coaching challenging on his personal life in that he on some days barely gets to see his wife. Yet, he commends her for supporting him as she realizes he wouldn’t be happy doing anything else. So, he returns home to LHU, a place that he recognizes has had its struggles on the gridiron. He says his new job is a responsibility that he doesn’t take lightly. Patrick Long and Ty Traister, two hometown guys with different roles at LHU but with similar missions.